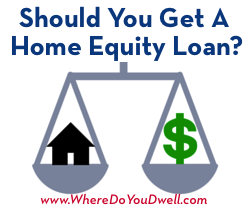 Should You Get a Home Equity Loan? As a homeowner, you most likely have gained some equity in your home since living there and paying your mortgage down. Have you ever considered using this equity to pay for a renovation or use for other parts of your life? Is it a good idea or not? We’ll break all this down for you right here. A home equity loan or line of credit, as it’s sometimes called, is a way to get the necessary funds to finance an addition to your home, start your own business, consolidate credit card debt, or finance another major need. But, just don’t think of it as your own personal ATM! The equity in your home is basically the difference in the home’s market value and what you still owe on it. For example, a home that’s worth $250,000 but has a $200,000 mortgage balance has $50,000 in equity. Therefore, a home equity loan (or term loan) allows you to take a loan amount based on your home’s equity plus other factors such as your income. This loan is sometimes called a second mortgage. Upon the loan’s approval, you get a lump sum and must repay a certain amount each month subject to a fixed interest rate, just like a first mortgage. The length of the loan is usually shorter than first mortgages – can be from five to fifteen years. Credit lines have variable interest rates rather than fixed rates so your repayments can change depending on the interest rate at the time you withdraw money. You should carefully review all requirements, fees, penalties and how often the interest rate is adjusted since HELOCs can vary depending on the lender. • You have the freedom to use the funds for whatever your need or needs may be, unlike student and auto loans that are very specific. Get a realistic idea of your property situation. If you bought your home at a good time and it’s located in a strong market, then you should have substantial equity. If you’re under water on your mortgage, then your home is not a candidate. First and foremost, take the take the time to review your particular neighborhood and your own home to see if these loans are an option for you. A lender will look at your complete financial picture. It’s not just your home’s equity that a lender will consider. They want to make sure you can repay the loan (and you don’t want to lose your home!). As part of the approval process, a lender will review your income, debts, and other financial obligations as well as your credit history. Ask yourself “why” you are taking out one of these loans. You should NOT use this loan for everyday expenses on clothing, vacations or gifts but rather for a very specific project or need. Taking out a loan just to have access to money for frivolous expenses is not wise. Consult with several advisors. Your situation is unique to you so get advice from several sources — talk to us at Dwell about the housing market, a lender about the implications of taking on more debt, a financial advisor about your larger financial picture, and a CPA about how this will impact your tax situation. Hope this helps you make whatever decision is right for you. Whatever you do, just be careful not to get in over your head and make sure try to only pull equity out of your home to go toward improvements to your home or life that will pay for themselves later.